Columbia Big Girls' Bella Plush Jacket, Deep Blush, Large | What Should I Say? Columbia Infant and Toddler Size Chart Columbia Little Kids and Big Kids Size Chart The girls' Bella Plush Jacket offers stylishly appointed cool-weather comfort with its super cozy vibes! Regular Fit is an easy, lightly relaxed fit for comfortable range of motion. 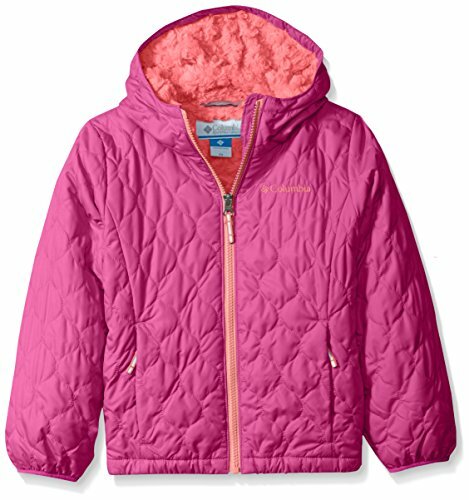 Low-loft insulated jacket with an amazingly plush, soft fleece lining through the hood and body. Microtex Lite™ II shell:• Lightweight taffeta shell and lining in a smooth face that glides easily over bottom layers.• Wind-resistant and water-resistant protection from light rain or snow.• 210T taffeta weave. Microtemp XF™ II insulation:• Low-loft polyfill insulation provides warmth without bulk.• Crimped polyfill increases surface area to improve warmth retention.• 100 g/m² fabric weight. Three-piece hood. Full-length zip with inner draft flap. Long sleeves with gathered elastic cuffs. Zip hand pockets. Straight hemline. Reflective detail accents the zipper pulls. Body: 100% polyester;Lining: 100% nylon;Insulation: 100% polyester. Machine wash and tumble dry. Imported. Measurements: Length: 17 in Product measurements were taken using size 2XS (4-5 Little Kids). Please note that measurements may vary by size.